Last month, I visited New York for the first time. I have read about so many bakeries in New York and wanted to see them. One of my best friends from college moved there and often told me about the bakeries. I was so excited to finally visit them. It was a blast to visit! My friend, her sister, and I walked all over Manhattan. I'm pretty sure we could have one of this red tour buses and create a NYC Bakery Tour. It's a good thing we walked all over the city because we sure sampled many treats! For the next weeks, I plan to write about the bakeries that I visited and will recreate recipes from the bakeries. I hope you enjoy my NYC Friday series! 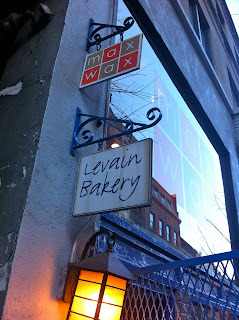 The first bakery in the NYC Friday series is the Levain Bakery. My very first recipe on the blog was inspired by a cookie from the Levain Bakery, so it seemed fitting to make the Levain Bakery first. The Levain Bakery is on the Upper Westside in Manhattan, with other locations in the Hamptons and Harlem. The bakery initially opened serving artisan breads, but expanded to cookies. The bakery is known for their gigantic six ounce cookies. It is a tiny shop, and you can smell the aromas of freshly baked cookies from over a block away. Funny enough, the co-owners of the bakery developed the cookie recipe while training for an Ironman Triathlon. They needed to increase their calorie consumption, so they decide on a big chocolate chip cookie. God bless them. My friend and I shared a dark chocolate peanut butter chip cookies. The combination of chocolate and peanut butter is one of my favorites. The dark chocolate cookie base with chocolate chips added the sweet flavor, and the peanut butter chips added in the savory taste. The Levain Bakery doesn't have a cookbook, but there are many bloggers with good souls who have been determined to recreate these cookies. I admire their tenacity and give kudos because this recipe created a cookie that was identical to that yummy cookie I enjoyed. In the bowl of an electric mixer fitted with the paddle attachment, cream together the butter and sugar until well-blended and fluffy. Add the eggs, and beat until incorporated. Then, add the cocoa powder. Next, mix the flour, salt, cornstarch, and baking powder until combined. Gently fold in the chocolate and peanut butter chips. Transfer the dough to a clean work surface and gently mix the dough by hand to ensure even distribution of ingredients. After removing from the oven, allow the cookies to cool on a rack. Store the cookies in an airtight container, and heat in the microwave for 5 to 10 seconds to freshen. * Note: Before baking the cookies, I froze the dough for about 15 minutes, as I have heard that the Levain Bakery does that to help the cookies have a gooey texture. Also your trip does sound brilliant! Oh how I want peanut butter chips!! I am dying for one of these cookies. I'm envious, I LOVE NYC !